From climate change to conflict in the middle East. Over the last 12 months, red24 has sent out approximately 7,000 alerts covering incidents from civil unrest and kidnappings to terrorism and tropical storms. We have also assisted numerous clients on the ground in operations from close protection to evacuations, highlighting the fact that travelling employees and global operations face a range of multifaceted risks. As such, suitable risk management and planning is a critical requirement, where effective contingency plans and crisis management teams can substantially reduce risks for employees, infrastructure, operations and profits. This is where red24 aims to offer companies and organisations an end-to-end risk- management solution, in which both preventative and reactive elements are in place. For due diligence and duty of care, organisations need to make sure threats are minimised, contingency plans are in place and that crises, should they occur, can be effectively handled. When employing new staff, we can conduct background screening checks for both high- and low-profile hires. If a situation arises we can conduct investigations or help manage a crisis response team. Unsure of how to deal with a product recall? We can help manage the process and mitigate the risks. Sending employees abroad? We can provide country risk assessments, direct or online safety training, information and support via mobile apps, daily safety checks on travelling personnel, or direct support in the form of kidnapping resolutions, close protection and staff evacuations. Essentially, we offer a range of products and services to ensure that organisations are equipped at all levels, from staff to operations, to minimise and manage risks and threats. red24’s 2017 Threat Forecast focuses on various political, security and kidnapping risks by region in the year ahead. 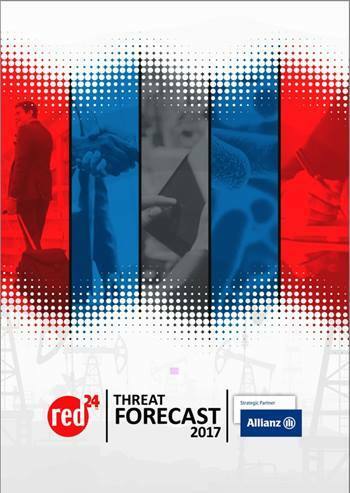 In addition, the Threat Forecast explores various topics related to product risks and identifies the key cyber security risks facing individuals and companies. We also look at our investigative services and how essential these can be for compliance and risk control. Combined, the document provides key decision makers with insight into how to mitigate threats to their organisations and companies. I trust that you find this information valuable and beneficial in planning for the year ahead.